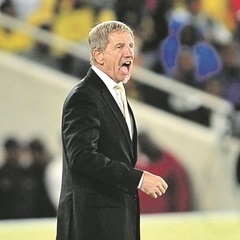 Polokwane - Stuart Baxter has challenged his players to play for the badge when they face Senegal in a meaningless World Cup qualifier on Tuesday – the game is a mere formality. With the game dubbed an “international friendly” because it is a dead rubber, Baxter still hopes his dejected players will give their all and play for pride and the country’s flag. “There is no need to motivate players to play for their countries. Anybody who is picked should play for pride and their future. The badge and the flag are very important, and players need to understand that,” said Baxter ahead of Tuesday’s return leg in Dakar. He is expected to ring in some changes and give players who did not feature in Friday’s 2-0 defeat to Senegal some game time. Some of the players who might get a chance include Phakamani Mahlambi and Motjeka Madisha of Mamelodi Sundowns. He hinted he might start to phase out some of the older players in the team. The old guard include Siphiwe Tshabalala and Morgan Gould of SuperSport United. “It is difficult to say now because it might seem like I’m criticising the players publicly. But it would be foolish for us to make wholesale changes to the team. That would be like throwing the baby out with the bathwater. We will have to be careful how we do it. “The question is: Is the national team a place to experiment or for development? I think you’ve got to take a chance in international friendly matches so they can gain experience". Baxter might be tempted to rest SuperSport United players who will be involved in the CAF Confederation Cup final next Sunday.